Do you have a favorite breakfast treat? I think I have a pretty equal appreciation for baked goods in the breakfast category. I might be a little more interested in popovers and croissants than muffins, but I certainly don’t shun them. Cinnamon rolls and Danish never disappoint me either. For that matter, I can be made very happy with some toasted, good bread and a fresh nut butter. Then, there are scones. They’re rich but not gooey, just sweet enough but not too much, and they accompany a hot cup of tea or a frothy cappuccino perfectly. And, Kurt is admittedly partial to scones above all other breakfast breads. He notices when it’s been a while since I’ve baked scones and starts dropping hints. 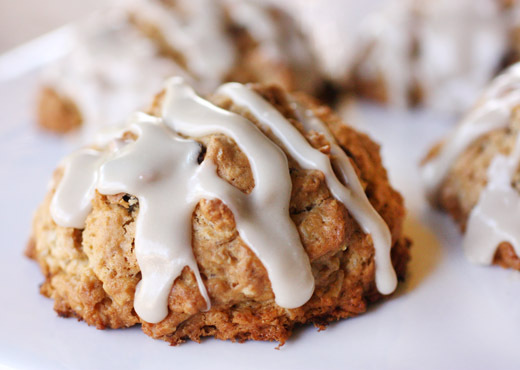 Thankfully, though, neither of us is picky about shape, size, or flavor when it comes to scones. That means I can experiment with any scone recipe that sounds interesting, and I found another one from the book Flour that looked like it was well worth a try. After sorting through bags of leftover nuts, dried fruit, and grains, I found everything I needed to make them. I did substitute walnuts for the suggested pecans, but that was the only change I made. 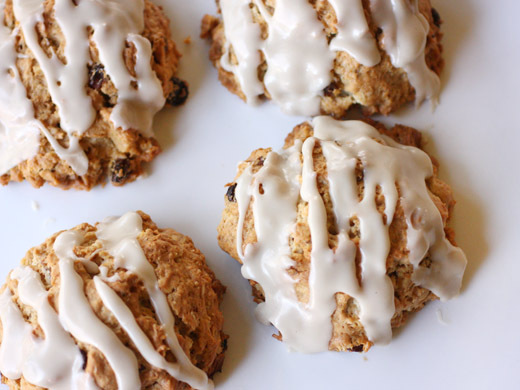 The dough for these scones comes together in the usual way, but here, it’s made in a mixer. Flour, oats, baking powder, baking soda, salt, golden raisins, and toasted and chopped nuts, walnuts in my case, were mixed in the bowl of a stand mixer until combined. Cold butter, cut into small pieces, was scattered on top and mixed for half a minute to break it into even smaller pieces and begin to incorporate it. In a separate bowl, cream, maple syrup, and an egg were whisked, and then that was mixed into the flour and butter until the dough just formed. Interestingly, the scone dough itself is only sweetened with the maple syrup and no additional sugar was added. Off the mixer, you should use a rubber spatula to move the dough around and make sure all the dry ingredients at the bottom of the bowl are worked into the dough. Rather than cutting the dough into shapes, here, it was scooped from the bowl into mounds on a baking sheet. The portioned scones on the baking sheet could have been frozen at this point and then baked directly from the freezer, but I put them straight into the oven. As the scones cooled, they were topped with a glaze made from confectioners’ sugar, maple syrup, and water. 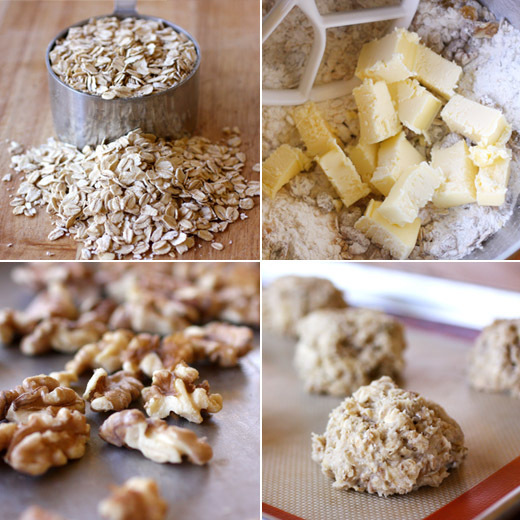 They had great texture from the oats and nuts and the chewy raisins, and they were filled with maple flavor. I liked the crispy edges on these scones that resulted from the dough being dropped on the baking sheet rather than the scones being cut. And, I liked how easy that made them to make. This was a winner of a scone variation, and now I have one more for the rotation when I hear those hints. My ears always perk up when I hear the words brown butter, and I believe this is the first time I’ve noticed those words followed by vinaigrette. Yes, brown butter was the oil for this vinaigrette, and it was pureed with sherry vinegar and marcona almonds which gave it a thick, creamy texture. 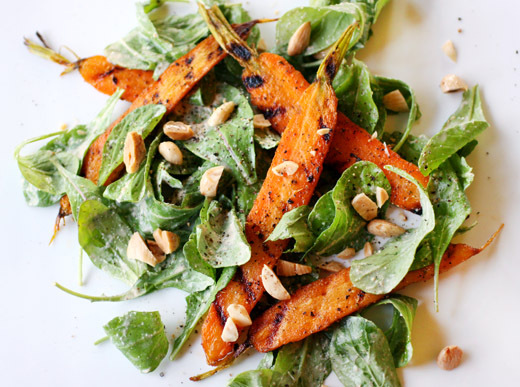 Not only did the vinaigrette in question sound enticing in this dish, there were also marinated carrots that were then grilled, and that marinade included smoked paprika, ground fennel, ground coriander, garlic, and fresh thyme. So, with brown butter, marcona almonds, and a great mix of spices, naturally, this was something I needed to try. This intriguing salad was created by Austin’s Bryce Gilmore of Barley Swine. He was chosen as a Best New Chef 2011 by Food and Wine, and this recipe appeared in last July’s issue. 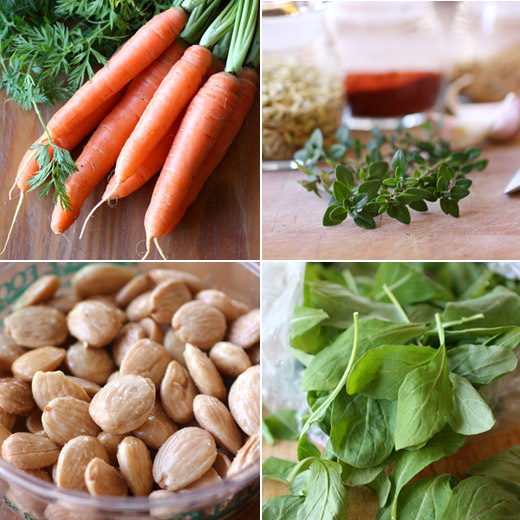 For a simple salad of carrots and arugula with chopped marcona almonds, there were some not-so-simple-at-all flavors at play. The carrots are going to be grilled, so you’ll want to keep them whole if they’re tiny or slice them in half lengthwise. Baby carrots with tops are recommended in the recipe, but I used some pretty, little full-size carrots from my CSA and halved them all. To start, you make the marinade for the carrots with extra-virgin olive oil, smoked sweet paprika, ground fennel, ground coriander, thinly sliced garlic cloves, and fresh thyme sprigs. The sliced carrots were left to marinate for a couple of hours, and then they were grilled on a grill pan on the stove until crisp-tender and nicely marked. Next, butter was browned and then placed in a blender with sherry vinegar, marcona almonds, and a little water. That mix was pureed into a smooth, thick, delicious sauce. I added some extra water to thin it just a bit. 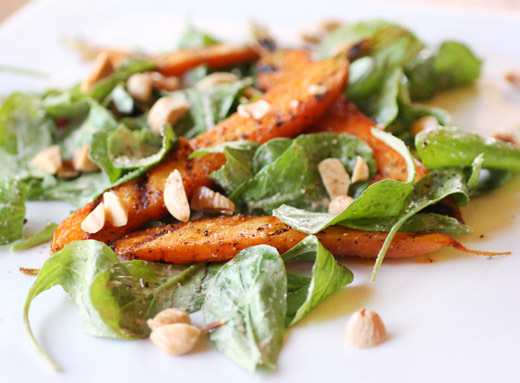 The grilled carrots and baby arugula leaves were tossed with the brown butter vinaigrette, and the plated salads were garnished with chopped marcona almonds. When something smells this good when it’s cooking, it’s usually not carrots, but as soon as they hit the grill pan, the lingering marinade was delightfully fragrant. And, the brown butter vinaigrette with marcona almonds? It did not disappoint. Now, I’ll be looking for ways to use both that marinade and vinaigrette in other dishes as often as I can. Anita Lo believes “there are no true borders in food.” Cuisines are constantly changing and being influenced by different cultures. And, her food is pushing that evolution another step forward. Her new book is Cooking Without Borders , and I received a review copy. In it, she describes her approach to building dishes with multiple points of reference. With a multicultural upbringing and world travels from a young age, she draws on various influences for her cooking style. After first learning classic French cooking technique, she then gained expertise in Korean and Vietnamese cooking. Often, her dishes combine European concepts with Asian ingredients. Despite the array of ideas contributing to each dish, the result is always refined and well-articulated. The recipes in the book include some of Lo’s home-cooking favorites as well as restaurant dishes, and some of them are definitely chef’s recipes. She does make good suggestions for modifications for the home cook whenever the process is lengthy or the ingredients are out of the ordinary. For her fried oysters with buckwheat and caviar, although it sounds like blini might be involved, the buckwheat is actually naengmyum which is a Korean noodle similar to soba. The dish was inspired by a mix of soba noodles and garnishes that Lo experienced in Japan. A fried oyster and caviar add briny flavor in different textures, and there’s a ponzu-style sauce balanced with dashi broth. She recommends more affordable American caviar for this and offers tips for a quick version of the dish made with store-bought ponzu. Like all the recipe descriptions in the book, this one clearly shows her thought process and her vision for the mix of flavors and textures in a unique dish. Some of the dishes I want to try soon are the slow-cooked salmon with smoked paprika and savoy cabbage, the roasted kabocha and maitake with bitter chocolate, and breast of duck with hoisin and figs. First, though, I was fascinated by a recipe in the Desserts and Drink chapter. 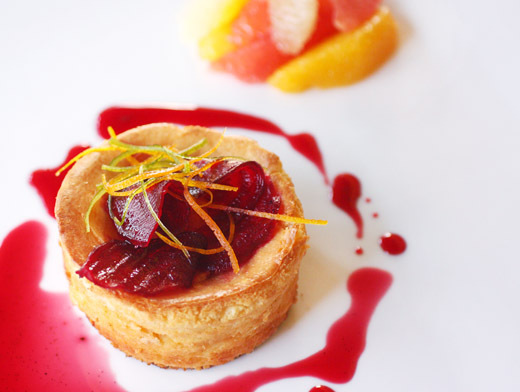 The goat cheesecakes with citrus and candied beets is an interpretation of a salad turned into a dessert. 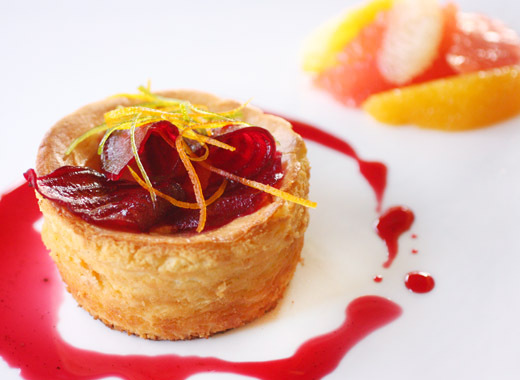 Rather than fresh chevre served with roasted beets and a citrus vinaigrette, the cheese became a rich, sweet cheesecake, the beets were candied with vanilla, and the citrus was used both as a fruit salad in syrup and as candied zest. It was a lot easier to prepare than I expected after seeing the photo of the pretty, plated dessert in the book. The individual cheesecakes were baked in ramekins with no waterbath required. Thin slices of beets were candied in a sugar syrup with both vanilla seeds scraped from a pod and vanilla extract. That syrup took on the dark pink color of the beets and reduced as the beet slices became tender. It was then dribbled on the plate as a sauce. Grapefruit, orange, and lime zests were candied in a separate sugar syrup, and then those fruits’ segments were macerated in that syrup. When the cheesecakes baked, they puffed and then settled in the center making a perfect space for the candied beets and zest. The only difficulty I had with this dessert was removing the cheesecakes from the ramekins. The two I unmolded as soon as they were cool enough to handle came out fine, but the ones that were chilled in the ramekins were difficult to remove. My suggestion would be to unmold them all as soon as possible and store them in a roomy, covered container to chill. Regarding this dessert, Lo suggests that some people may think of it as a mix of a cheese course and dessert. For me, this was entirely dessert. 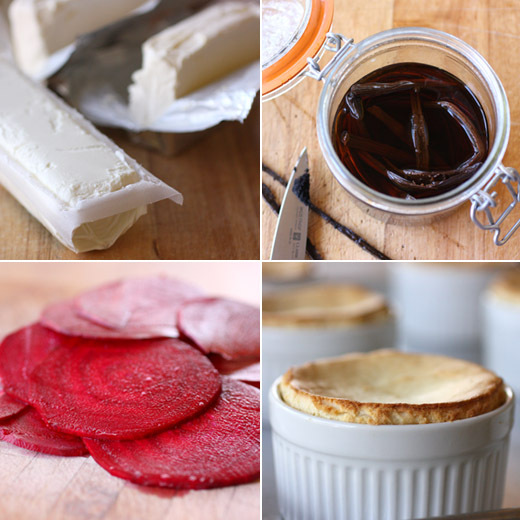 The beets took on sweet, vanilla flavor and complemented the cheesecakes very well. Meanwhile, the citrus was bright and fruity and delicious with the sauce on the plate. This is thought-provoking food which is interesting to prepare and delightful to eat, and I know I’ll learn something new about flavors every time I cook from this book. See my review of Cooking Without Borders and get this goat cheesecakes with citrus and candied beets recipe at Project Foodie. I’m not sure that this is a chowder. 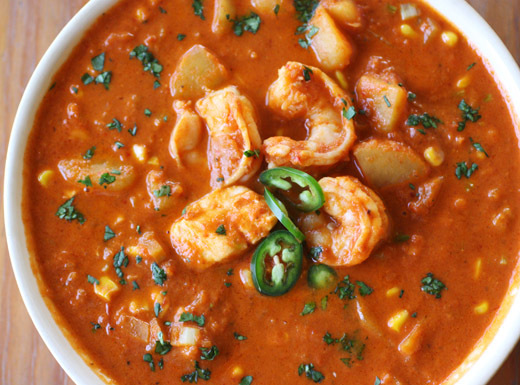 It might be a mix of Manhattan chowder, bouillabaisse, cioppino, and maybe chili if that’s even possible. But, that’s not what’s important here. This was one of those recipes that had me doing a happy dance in the kitchen as I tasted while I cooked. It's from the March 2011 issue of Food and Wine. A soup base was built from torn pieces of ancho chiles, onion, garlic, and fennel seeds that simmered in white wine before crushed tomatoes were added. Long before any seafood made its way into the soup, it already tasted like it was intended to be there. The flavor from the fennel seeds was like a splash of Pernod in bouillabaisse. The soup base was pureed and then potatoes, red onion, chopped fennel bulb, and corn formed the building blocks of the chowder before shrimp, halibut, and clams were added. The aroma from the stove was already fantastic from the earthy chiles, aromatics, and fennel, and then some smoked paprika made it even better. There was a lot going on in this soup, but all of those flavors were mingling very harmoniously. I was pretty sure I had a winner of a meal on my hands, and soon enough, that suspicion was confirmed. I should explain that Kurt doesn’t always freely offer his opinion of meals. Usually, I have to ask, and usually, his answer is that “it’s good” or “it’s fine.” Clearly, I have a more emotional attachment to food to say the least. This time, with no prompting whatsoever, he proclaimed his delight, saying something like “now this is great flavor,” and coming from him, that’s extremely high praise. There are multiple steps to making this so-called chowder, but there’s a perfect stopping place if you’d like to start prepping in advance. You begin by cooking chopped yellow onion, some smashed cloves of garlic, torn pieces of ancho chiles, and fennel seeds in oil in a large pot. When the onion is browned, some white wine is added and simmered until reduced by half. Canned crushed tomatoes and water are then added, the mix is brought to a boil, and it is simmered again until the vegetables are very tender. You should allow the mixture to cool slightly, and meanwhile, whole milk is added for a touch of richness. This soup base is then pureed in batches, and after pureeing, you could stop here and store the soup in the refrigerator until you’re ready to continue. Next, clams are steamed in water and then removed from their shells and chopped when cool enough to handle. The clam cooking broth is then strained, added to the pureed soup base, and that is set aside. Chopped potatoes are cooked in oil until browned, and then minced red onion, finely diced celery and fennel bulb, and thawed, frozen corn kernels are added followed by smoked paprika. After the cooking the vegetables briefly, the soup base is returned to the pot and brought to a boil. 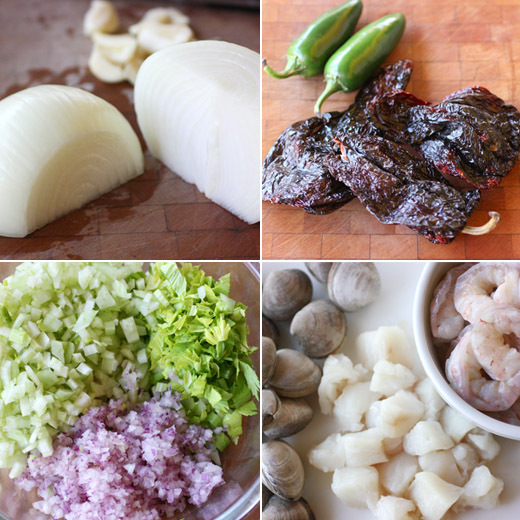 Last, shrimp, chunks of halibut, and the chopped clams are added to the soup and simmered just a few more minutes. 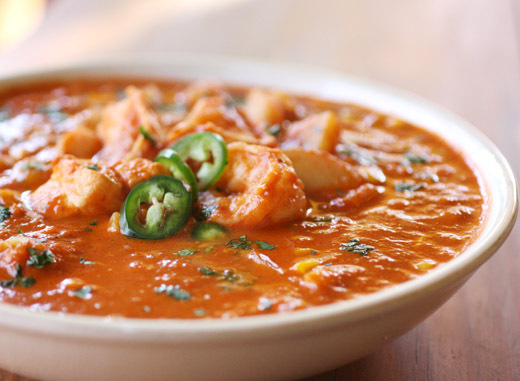 It’s a little unusual to find a hearty soup with big, earthy flavors and lots of spice that includes seafood, and it’s just as unlikely to see Southwestern flavors mixed with fennel seed and chopped fennel bulb. Somehow, it all worked together beautifully. The potatoes made it hearty and substantial, the anchos delivered some subtle spice, and the seafood was fresh and light among everything else. This is one for the permanent file. I usually associate burrata with summer, but that's only because it goes so perfectly with ripe tomatoes and basil. 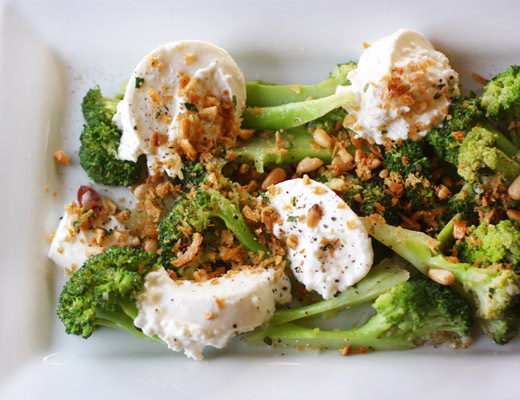 It's available at any time of year though, so I changed my thinking about it after trying this warm, wintry broccoli salad. I've had the page with this dish marked in Sunday Suppers at Lucques since I first read the book, and I knew it was going to be good. 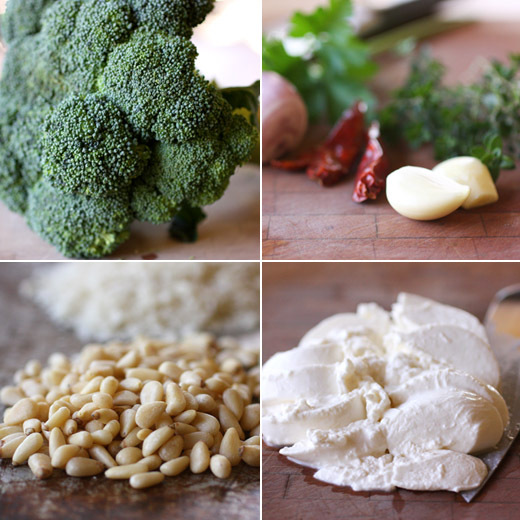 How could it not be with blanched broccoli which happens to one of my favorite vegetables, creamy, fresh burrata, a warm vinaigrette with garlic, chiles, anchovies, lemon, and butter, and a crunchy, toasted breadcrumb and pine nut topping? This is a filling salad. So, if you're serving it as a first course, you'll want to follow it with something on the lighter side. Or, it also makes a great lunch all by itself. As usual with dishes from this book, there are a few steps involved, but the result is worth every bit of chopping and every dirty dish. The first step is to toast the breadcrumbs and pine nuts, and the suggested procedure involved using two baking sheets to toast them separately. I tossed the breadcrumbs with some olive oil on one side of a big sheet pan, and let them get a head start in the warm oven. Then, I added the pine nuts to the other side of the same sheet pan, and toasted them in the oven for a few minutes while the breadcrumbs reached a good level of toastedness. Once removed from the oven and cool, half of the pine nuts were chopped, and they were combined with the whole pine nuts, the toasted breadcrumbs, some chopped parsley, and salt and pepper. I left all of that on the sheet pan to avoid using a bowl for the mixture. Next, broccoli was blanched and drained. I let mine drain in a colander rather than spreading it out on yet another sheet pan as was suggested. The warm vinaigrette was supposed to have been started in a saucepan and then finished in a saute pan. I skipped the saucepan and used the saute pan from start to finish. The recipe calls for seven tablespoons of olive oil and six tablespoons of butter which seemed like way too much of both to me. I used maybe three tablespoons of olive oil and two of butter. They were combined in the saute pan over low heat, and a minced anchovy and chopped dried red chile were added. Once the anchovy had melted into the oil and butter, minced garlic and thyme leaves were added followed by chopped shallots and lemon juice. The drained broccoli was then tossed in the warm vinaigrette in the saute pan. Last, the burrata was sliced and the salad was plated with the total number of pots and pans used reduced by one half. 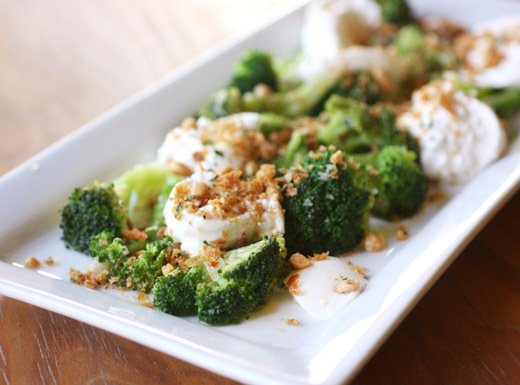 This was a bit of a process even after simplifying a few steps, but because of the contrast of the fresh, cool, mild cheese with the robust flavors of the warm vinaigrette and broccoli, I wouldn't change anything else about it. Happily for me, burrata isn't just for summer anymore. Hugh Acheson, What Are You Reading? Currently, Hugh Acheson is appearing as a judge on Top Chef Texas which I’ve been watching with hometown pride. He was also a recent competitor on Season Three of Top Chef Masters. When he’s not on TV, he’s busy as chef/partner of Five and Ten, The National, Gosford Wine, and Empire State South in Athens, Georgia. Hailing from Ottawa, Canada, he’s not a native to the US South, but over the years, he has developed his own approach to Southern cooking with a European influence. He was a Food and Wine Best New Chef in 2002, has been a James Beard nominee for Best Chef Southeast in 2007, 2008, 2009, and 2010, was a 2007 Rising Star chosen by StarChefs.com, and was included as one of the 100 contemporary chefs in Phaidon Press' Coco: 10 World-Leading Masters Choose 100 Contemporary Chefs . His new book is A New Turn in the South which offers 120 recipes showcasing his fresh take on Southern cuisine. With his busy schedule, I was lucky to steal a moment of his time to ask: what are you reading? I think there is a health movement afoot in the food world that is going to embrace vegetable based diets more than ever. I am a huge proponent of a shrinking meat protein size on our dinner plates and filling in with an abundance of great local vegetables and grains. This beautiful book is a great generator of ideas for me these days, served up in a beautiful layout. Cool book. The North American edition is coming out in April, but I bought my fine copy at Omnivore Books, in San Francisco, one of the best cookbook stores in the whole wide world. Edna was ahead of her time. She was a true woman chef in a male dominated trade. She was a refined voice that defined Southern food in a whole new light. This book recounts the flavors of her youth and is an essential read in realizing why Southern food is so pertinent now and how it has long been misunderstood. It’s less about lard than about blackberries and fresh eggs. Lovely book. Who else gets a bible printer to produce their book in a very old-timey edition that reads like a long lost primer of seasonal Italian food? The Franks are so stylish and current and curate the best little neighborhood spots, spots you would long to have in your hood. The book is great, and the words bounce off the page in such a happy way with the crafty sensibility of Pete Meehan, who co-wrote the Momofuku cookbook. I love the flavors of the Eastern Mediterranean and not since Wolfert’s The Cooking of the Eastern Mediterranean have I been this excited about a book focusing on the region. This book is getting used in our home kitchen. Soiled and dog-eared like all good cookbooks. The restaurant that it comes from is changing the way London eats with great to-go food and a really thought-through menu. Vegetable heavy again. The world is changing. Because it’s awesome. Really great homage to the classic regional Junior League project. But better than they ever were. Thank you for participating, Hugh. Check back to see who answers the question next time and what other books are recommended. 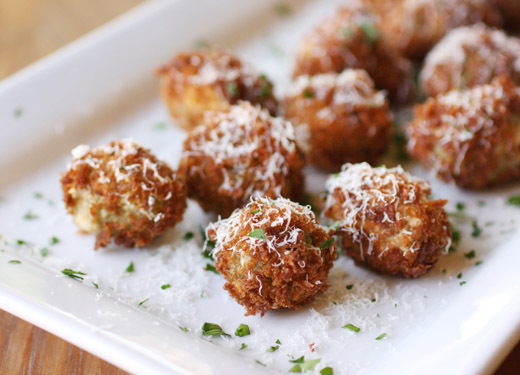 Have you had fried olives? 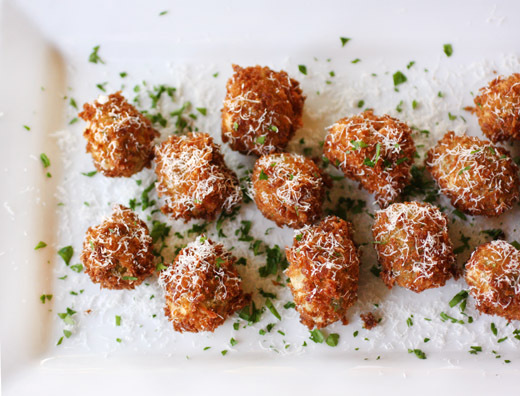 I ask because Amamda Hesser writes in The Essential New York Times Cookbook "If you've never had a fried olive, do not let another day pass without tasting one." And, I couldn't agree more. I had enjoyed fried olives at restaurants, but when I saw this in the Hors D'Oeuvres chapter of TENYTC, I knew it was time to make them at home. In each chapter of that book, the recipes are listed chronologically according to when they appeared in the newspaper. I was charmed by the Hors D'Oeuvres chapter from the earliest entries. The salted and deviled almonds from 1897 and eggs suffragette from 1909 made me want to start planning a cocktail party. By the time I got to the fried olives from 2004, I was ready to start cooking and then mix some drinks. Having to fry something for a party never sounds like fun, but these crispy, little orbs hold up well for a few hours. You can do the frying in advance, and then re-warm the fried olives in the oven. There are suggestions for serving them with wedges of lemon, fennel slices, radishes, or a dusting of parmesan cheese. I liked the idea of a parmesan garnish and added some chopped parsley as well. At our two grocery stores that I visit every week, and often several times a week, we have really good selections of olives. I can buy various types of olives stuffed with all kinds of ingredients, but since I was going to the trouble of breading and frying them, I decided to buy plain olives and stuff them myself. 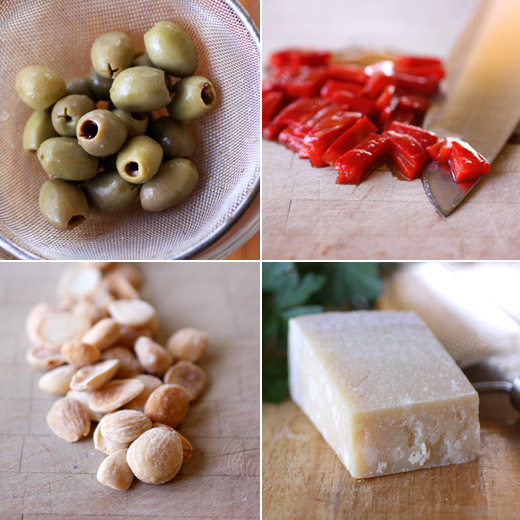 I chopped marcona almonds and piquillo peppers into thin strips and stuffed pieces of both into each olive. Other options might have included blue cheese, anchovies, other nuts, pickled vegetables, spicy chiles, or whatever sounds good in an olive. The stuffed olives were breaded by rolling them in flour, dunking them in egg, and then coating them with breadcrumbs. You can bread the olives in advance and refrigerate them until you're ready to begin frying. I heated olive oil in a saucepan and fried four or five olives at a time. They become golden in a minute or less and should then be drained on a paper towel-lined sheet pan. Crispy and salty goes perfectly with bubbly. Champagne would have been an obvious choice, but instead, I poured a glass of sparkling, hard cider and it was a great match. The warm, crunchy-coated olives disappear quickly, so if you're serving a crowd, make more than you think you'll need. One of my resolutions for 2012 is to keep trying with the very-wet category of bread dough. I’ve been open about my inability to bake ciabatta with a fabulous, holey structure. And, it’s not just ciabatta that flummoxes me. The basic country bread from Tartine Bread is also made with a very wet dough, and I’ve yet to create anything with big holes from that recipe either. The baking technique suggested in that book is the covered cast iron pot method. A proofed loaf goes into a hot cast iron pot, the pot is covered with a hot lid, and the moisture from the dough steams inside the pot as the bread begins to bake. I’ve had mixed results with that method in the past. On one occasion, the dough was just too wet, and the resulting baked loaf was a little soggy on the bottom. I made some changes to the dough, tried again, and this time, the cast iron pot baking method worked fine. To hedge my bets since this recipe makes two loaves, I actually baked one loaf in the cast iron pot and one directly on a baking stone. The loaf from the cast iron pot was the better of the two since the pot prevented the loaf from spreading. However, I still didn’t find those lovely, big holes in the crumb. Hence, I vowed my resolution to keep trying. In Tartine Bread , after introducing the basic country bread, there are a few variations including this polenta and pepita option. 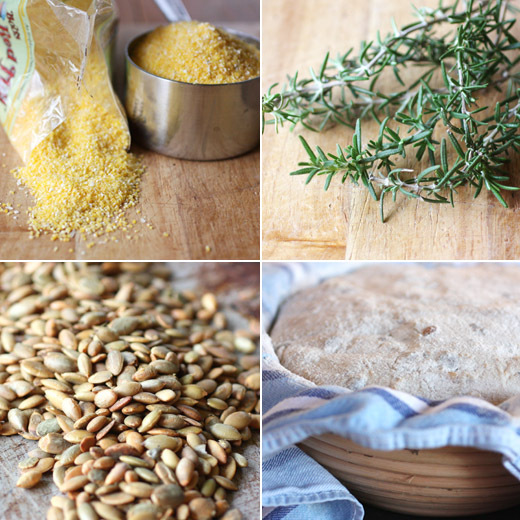 Soaked, coarse-grained polenta, toasted pepitas, and chopped fresh rosemary are added to the basic dough. It’s a chewy, hearty bread with a crunchy, dark crust. I mentioned that I made a couple of changes this time. 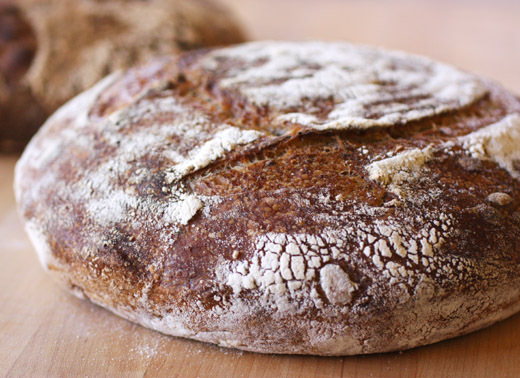 First, one of the suggestions for beginning the basic country loaf is to make a leaven using only a tablespoon of mature starter to prevent the resulting dough from having a too-sour flavor. My mature starter isn’t very sour in flavor, so I ignored that and just fed my starter as usual to use as the leaven for the dough. Next, the dough is suggested to be mixed by hand, but I used a stand mixer with a dough hook because it’s easier. The leaven was combined with water, white flour, and whole wheat flour and left for the autolyse. After about 20 minutes, another 50 grams of water was to have been added. Since my dough seemed extra wet last time, I skipped that additional 50 grams of water. Also after the autolyse, salt was added. Then, the dough was to have been placed in a bowl for the bulk fermentation with turns every half hour. The soaked polenta, toasted pepitas, chopped rosemary, and some corn oil were to have been added after the second turn. 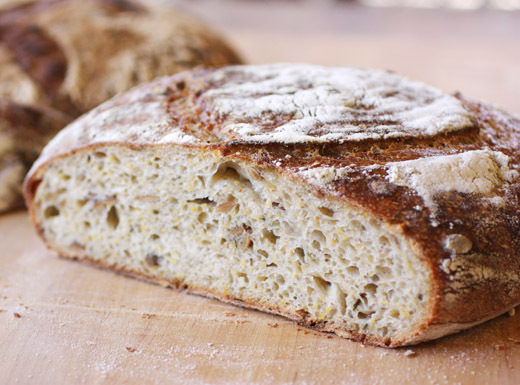 I followed those instructions when I made the flax and sunflower seed whole wheat bread, and it was difficult to get the seeds mixed into the dough at that point. So this time, I added the polenta, etc. in the mixing bowl along with the salt right after the autolyse. Then, I transferred the dough to a bowl to ferment for about four hours. It was turned in the bowl every 30 minutes. After four hours, the dough was transferred to a work surface and divided into two pieces. Each piece was shaped into a round, but the wet dough spreads easily so the rounds should be well-spaced apart. The rounds were left to rest for 30 minutes. Final loaf shapes were then formed, and towel-lined baskets were sprinkled with a mixture of rice flour and wheat flour before the loaves were placed in them. I opted for a delayed final rising of the dough by covering the proofing baskets and leaving them in the refrigerator overnight. The next day, I baked one loaf in a heated cast iron pan. After twenty minutes of baking, the lid was removed. I baked the other loaf on parchment, which made the wet dough easier to transfer from the peel, directly on a baking stone. The loaf on the stone spread more and browned more, and the cast iron pot method worked well. What I’ve learned is that maybe sometimes a wet dough is just too wet. Skipping the additional water seemed to be a good thing with this version. I still haven’t learned how to get those lovely holes throughout a loaf, but hopefully if practice doesn’t make perfect it will eventually make better. Meanwhile, I had two big, round loaves of rustic, homemade bread full of crunchy pumpkin seeds and corn and rosemary flavors to enjoy. The very first post of 2012 should be sort of healthy, shouldn't it? Consider this a gateway dish to ease into the healthy January phase. 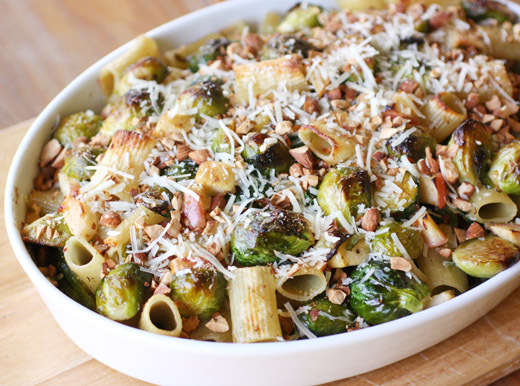 It is a dish of baked pasta and there is Gorgonzola cheese in it, but there are also nutritious, little Brussels sprouts and chunks of apples. Unlike most baked pastas, there's no thick, rich bechamel sauce coating every bite. Instead, the pasta and Brussels sprouts are tossed with crumbled blue cheese, or whatever easy-melting cheese you prefer, and some of the water in which the pasta was boiled. It's lighter than you might expect. The dish came from the Mark Bittman blog, but I couldn't help making a couple of changes. The original was made with figs, but there's a note that pears, apples, and cranberries would all do the job of adding a little sweetness. I had some apples in the refrigerator waiting to be used, so they were my choice. I also opted to saute the Brussels sprouts rather than boil them as suggested because I can't resist browned edges on Brussels sprouts. Clearly, this can be customized in countless ways, but with the basic pieces in place, you'll get a quick dish that delivers a great range of flavors. Since everything cooks quickly before being mixed and placed in a baking dish, you should chop everything you need before starting. While the rigatoni cooked for a few minutes, and it shouldn't be cooked until done but only half-way, I sauteed Brussels sprouts that had been trimmed and halved. I also added some minced shallots to the saute pan. When the Brussels sprouts were nicely browned, I added two small, chopped apples. Most importantly, don't forget to save some of the pasta boiling water before draining the rigatoni. 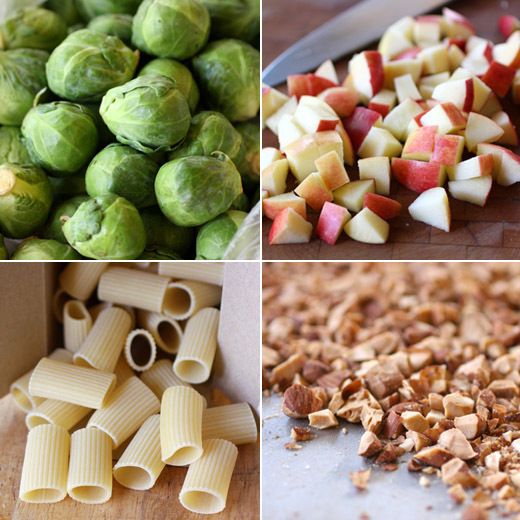 Then, toss the half-cooked rigatoni with the Brussels sprouts and apples and stir in the Gorgonzola crumbles. Add a few tablespoons of the pasta water and stir to combine. The pasta mixture should then be placed in an oiled baking dish and popped into a 400 degree F oven for 20 minutes. If it appears the pasta is becoming too dry in the oven, add a little more pasta water after 10 minutes of baking. 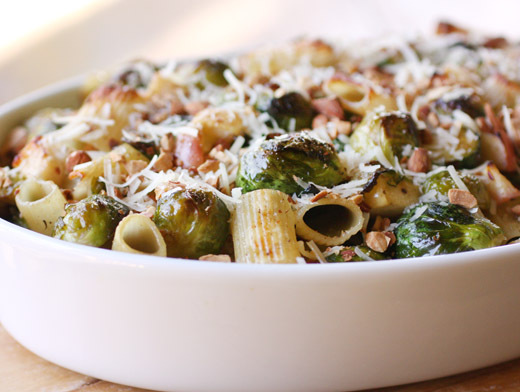 When you remove the dish from the oven, top the pasta with chopped, toasted almonds. Edges of the rigatoni pieces on top turned brown and crispy in the oven, and underneath, the pasta and Brussels sprouts were tender for a tasty contrast. The cheese melted into all the nooks and crannies, and the apples did their job of adding sweetness. There were bitter, savory, and sweet flavors, creamy cheese and nutty almonds, and I can't think of anything this dish was missing. It was a great way to begin the year, and I hope your 2012 is off to a good start as well.